An option to make use of the HS2 lines from Meadowhall to reduce journey times between the city centres of Sheffield to Leeds is being examined, as well as an option to locate the South Yorkshire HS2 station at Victoria. The options are discussed in an influential report from the National Infrastructure Commission (NIC) that is calling on the Government to provide immediate and very significant investment to increase capacity, decrease travel time, and improve reliability vital to improving connections between economic centres in the North. The Northern Powerhouse idea includes the six Northern city regions of Hull, Leeds, Liverpool, Manchester, Newcastle and Sheffield where the transport infrastructure means that it takes longer to get from Liverpool to Hull by train than it takes to travel twice the distance from London to Paris. Manchester and Leeds are less than 40 miles apart but on the congested M62 this often takes more than two hours by car. The Commission recommends that funding be provided to further develop the long-term plan for HS3 - the high speed rail link across the North - and integrate it with HS2 and planning for the redevelopment of the North's gateway stations. On roads, investment should be brought forwards for an early boost in capacity on the M62, alongside funding to identify and assess proposals for tackling a range of other strategic challenges. 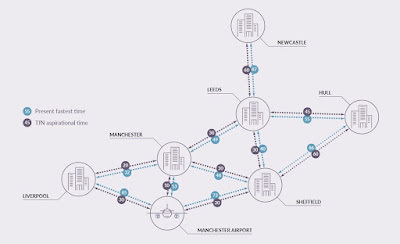 Whilst the report focuses on improving links to Manchester, for Rotherham and the Sheffield City Region, the importance to boosting the economy by reducing journey times between Sheffield and Leeds and Sheffield to Manchester is highlighted. Transport for the North (TfN) - which brings together representatives from across the North - would like to see these journey times reduced to 30 minutes. For rail, the report states that HS3 should make use of key northern sections of HS2 – for example between Leeds and Sheffield where journey times could be reduced to just 30 minutes – upgraded lines, and sections of new track where necessary. With the Government continuing to back a South Yorkshire HS2 station at Meadowhall, the report states: "There are further opportunities to better link the northern cities using the infrastructure of HS2 that have not yet been committed to on the Leeds-Sheffield and Liverpool-Manchester corridors. "The journey time between Leeds and Meadowhall would be 17 minutes, down from 49 minutes today. This, in itself, will not result in an improved intercity journey between the centres of Sheffield and Leeds. "Options to connect Sheffield city centre to HS2 have been identified, however, that could reduce the journey time between Leeds and Sheffield city centres to TfN's aspiration of 30 minutes or potentially lower. "These include a link from Sheffield Midland station to Meadowhall that would allow compatible through-running of trains on the HS2 line to the north, as well as the possibility of the HS2 station being situated in Sheffield city centre rather than at Meadowhall. Each of these options should be explored to identify how a journey time as close as possible to the 30-minute aim between Leeds and Sheffield city centres could be delivered, how the most effective proposal can be achieved most efficiently and how it can best be integrated with planning for the wider HS3 network." Sheffield City Council is backing the option to site the HS2 station closer to the city centre at Victoria, mirroring the decision to bring HS2 and HS3 together in Leeds. Whilst HS2 will not offer opportunities to improve connectivity between Sheffield and Manchester directly, there is potential for it to contribute to reduced travel times on the corridor indirectly. The report indicates that electrification and second hand Pendolino trains could see rail journeys reduced to 40 minutes between the two compared to 48 minutes currently. On roads, the commission discusses the potential Trans-Pennine link between Sheffield and Manchester. Major studies are currently in progress on the potential for a tunnel under the Peak District between the two cities. The report disccusses the smart motorway schemes on the M1 and future capacity enhancements to Junction 35a - 39 which would take it between Sheffield and Leeds. It also highlights that infrastructure such as the Tinsley Viaduct will "need major work to stay open for the long term." Sheffield want everything in Sheffield. They know the rest of South Yorkshire will not benefit as much if it opens at Victoria but they do not care. This Sheffield City Region project is also dangerous. Evans wanted to build those new offices on Forge Island but were denied funding, i wonder if the same plan was put forward for somehwere in Sheffield, finding would be found. Its a point ive made many times.Rotherham and Barnsley need to stick to there guns and oppose any move to put any HS2 station in Sheffield.We will only get any benifit from a Meadowhall station.Its actually Sheffields arrigance that hold Rotherham back.I see there trying to claim the AMP as theres now,and even Magnas in Sheffield ,dont you know!!!! !